​Ben and Matt Woodhart started as carpenters and now run a regional business from Westdene working with some of the UK’s leading developers. We provide a range of construction solutions through our dedicated specialist businesses of Construction, Carpentry, Lofts & Extensions and Scaffolding working for local authority and private clients. Why did you get involved in The Barn? 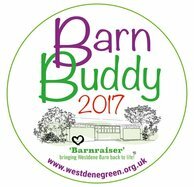 Barn Buddies is a unique scheme which recognises the regular financial support local businesses give to The Barn and promotes their goods and services to the Westdene community in return.